OBR India in collaboration with ANHAD, MKSS, PUCL and SNS is organizing aNational Women’s Convention on February 12, 2019 from 9am to 6pm at the Constitution Club, New Delhi to safeguard the Indian Constitution and its values. 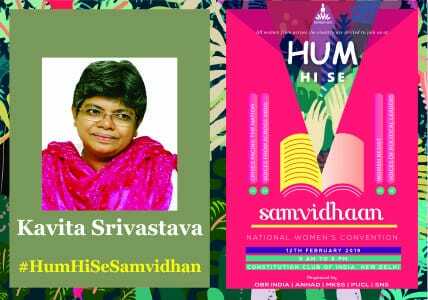 The Hum hi se Samvidhaan (हम ही से संविधान) convention is aimed at uniting voices of dissent against the targeted attacks on the Constitutional rights of women in India. The growth of fascist and neo-liberal forces in the country, and the resulting rise in violence in society, has deeply impacted the lives of women. Attacks on minorities, especially Muslims, Dalits and Christians, which have taken various forms including fake encounter killings and mob lynching by the cow vigilantes have created an atmosphere of fear and insecurity. There is a steady deterioration in the rule of law, and the basic constitutional commitment to equality. Neo-liberal economic policies and growing crony capitalism have adversely impacted women in general, but especially those who belong to the Dalit, Adivasi and other marginalized communities. Their fragile economic base has been devastated. The last few years, have witnessed a frontal attack on the Constitution, particularly on the freedom of expression it guarantees – the right to dress, speak, write, eat and choose – which impacts women disproportionately. We wish to claim our constitutional and democratic rights, including the right to equality and the right to express ourselves without encumbrance or fear. This convention is a step towards that direction. It aims to bring together women from across India to collectively strive for a more peaceful and just society. Women Speakers from across India- grassroots activists, feminists, academicians, lawyers, intellectuals and women political leaders will be participating in the convention. The speakers and performers include : Abha Bhaiya, Alka Lamba, Amarjeet Kaur, Angela Rangad, Anjali Bhardwaj, Annie Raja, Brinda Karat, Dayamani Barla, Geeta Seshu, Jagmati Sangwan, Jayati Ghosh, Kalyani Menon-Sen, Kavita Krishnan, Kavita Srivastava, Lara Jesani, Nadiya Shafi, Nivedita Menon, Noorjahan Diwan, RAAG – Revolution, Azaadi and Aman ke Geet, Rachana Mudraboyina , Radhika Vemula , Richa Singh, Ruth Manorama, Shabnam Hashmi, Soni Sori, Supriya Sule , Sushila , Sushmita Dev, Syeda Hameed, Uma Chakravarti, Vandana Chavan, Vrinda Grover. Kindly depute a reporter and a photographer to cover the program.